Our next Total Solar Eclipse will originate at Latitude 7.8324° S Longitude: 158.5364° W in the South Pacific Ocean's Cook Islands near Penrhyn Atoll on April 8, 2024. The Path Of Totality will travel in a north easterly direction and make landfall near Mazatlan on the Mexico coast around 12:10 PM (Mountain Daylight Time). Both the Point of Greatest Duration and the Point of Greatest Eclipse will occur in the Nazas - Bermejillo region northeast of Durango, Mexico. The eclipse will start to cross the United States at Radar Base, Texas (north of Eagle Pass, Texas) around 1:25 PM (Central Daylight Time). • As the Path Of Totality crosses Texas it will partially include the cities of San Antonio, Austin and Fort Worth and all of Arlington, Dallas (largest city entirely in the Path Of Totality), Killeen, Temple, Texarkana, Tyler and Waco. • On a line from Polk to Pocola, the far southeast corner of Oklahoma will be in the Path Of Totality. • The Path will cross Northwest Arkansas from Bonanza / Texarkana on the West to Bull Shoals / Portageville on the North - including Hot Springs, Jonesboro, and Little Rock. 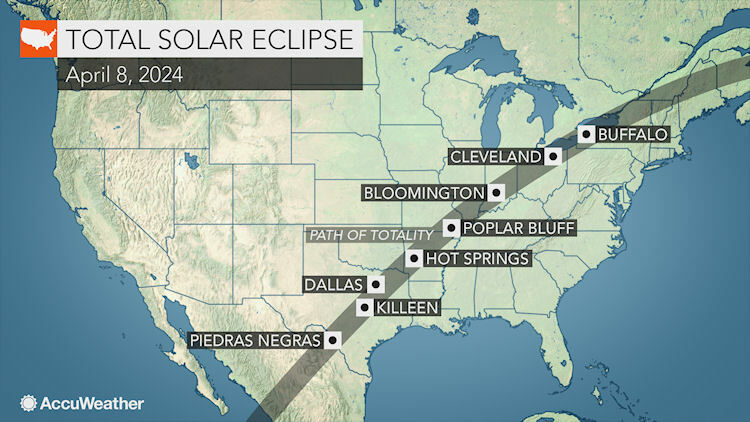 • The Southeast corner of Missouri on a line from Dugginsville to Bloomsdale will be in the Path Of Totality - including Poplar Bluff, Cape Girardeau and Farmington. • Soon after entering Illinois, the Paths Of Totality from the 2017 and 2024 Total Solar Eclipses will cross at Latitude: 37.6421° N Longitude: 89.2654° W near Carbondale, Illinois. X marks the spot. 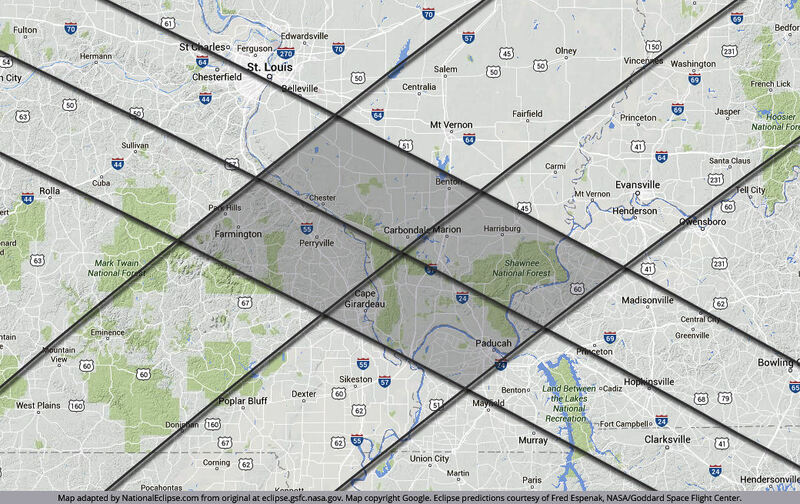 Marion, Harrisburg and Metropolis are also in the Eclipse Path Of Totality. • Kentucky cities in the Path Of Totality include Paducah, Marion and Henderson. • Indiana cities including Bloomington, Evansville, Indianapolis, Muncie, Mount Vernon, Terre Haute, and Vincennes are in the Path Of Totality. • a very small area of Michigan East of Lambertville and South of Luna Pier are included in the Path Of Totality. • Ohio (including Akron, Dayton, Lima, Toledo, Cleveland, Warren, Newton Falls and Austintown). • Pennsylvania including Erie and Meadville will also be briefly darkened. • Upstate New York including Buffalo, Rochester, Syracuse, the Adirondacks, Potsdam, and Plattsburgh will also go dark. • Northern Vermont including Burlington, Montpelier and Newport are included in the path. • New Hampshire's Lancaster and Colebrook lie in the Path. • In Maine the Path Of Totality passes almost directly over the state's highest point Mount Katahdin. 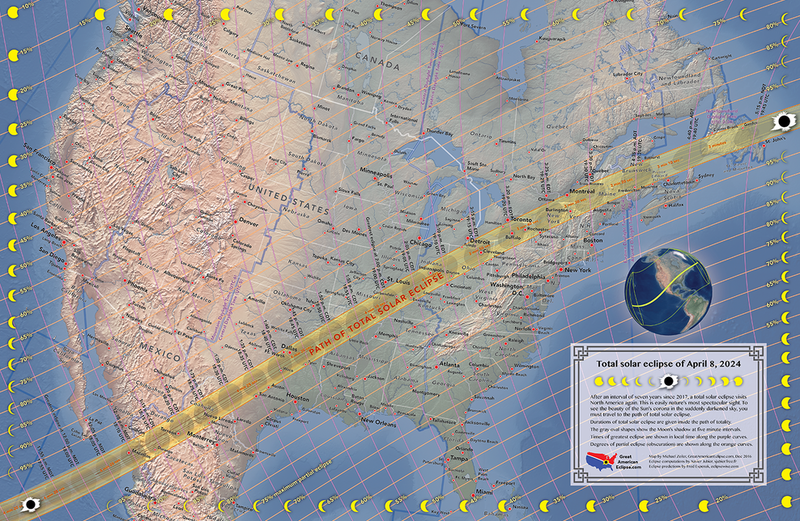 • The Eclipse will then cross New Brunswick, Nova Scotia on it's way to Newfoundland. • The Path Of Totality will cross Bonavista, Newfoundland as it goes "feet wet" over the Atlantic Ocean until the alignment between the Sun and Moon seperates at Latitude: 47.5721° N Longitude: 19.79° W ending the "Great American Eclipse". See also: Travelocity's 8 Cities With A Front Row Seat to the 2024 Total Solar Eclipse. EYE SAFETY - The only time that the Sun can be viewed safely with the naked eye is during the "TOTAL" phase of an eclipse, when the Moon completely covers the disk of the Sun. It is never safe to look at a partial or annular eclipse, or the partial phases of a total solar eclipse, without the proper equipment and techniques. Even when 99% of the Sun's surface (the photosphere) is obscured during the partial phases of a solar eclipse, the remaining crescent Sun is still intense enough to cause permanent retinal damage, especially when viewed through binoculars or other optical aids. ||• Prefocus camera without filter. Use Mars, Jupiter, a bright star or clouds on the horizon. ||• With the filter on you can use sunspots or the sun's edge to focus on before the eclipse starts. ||• The Light Sensors in modern cameras need as much protection as your eyes. Use proper protection. Repeating - Eye & Camera safety - The only time that the Sun can be viewed safely with the naked eye is during a total eclipse, when the Moon completely covers the disk of the Sun. It is never safe to look at a partial or annular eclipse, or the partial phases of a total solar eclipse, without the proper equipment and techniques. Even when 99% of the Sun's surface (the photosphere) is obscured during the partial phases of a solar eclipse, the remaining crescent Sun is still intense enough to cause permanent retinal damage, especially when viewed through binoculars or other optical aids.